I have to admit, I’ve been starting to cool a bit to the whole idea of sandbox games. Granted, I’ve spent countless hours playing Minecraft and Terraria, but I started to get tired of the same old environments and enemies. 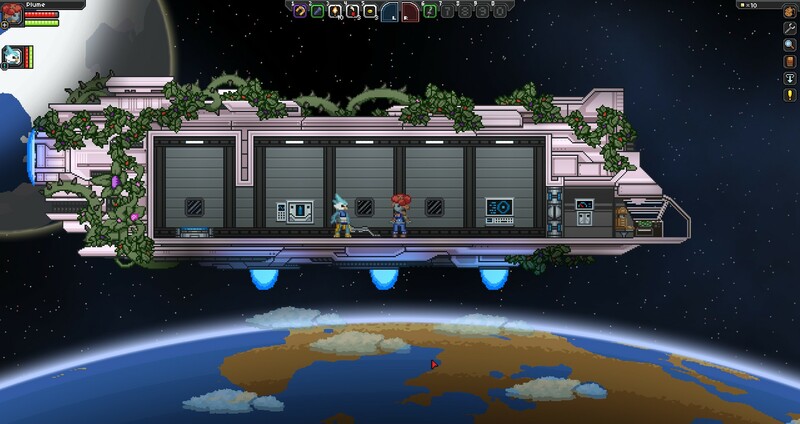 Then came along Starbound, a sci-fi sandbox title from Chucklefish Games which promised a huge universe of planets to explore, with countless different kinds of monsters to fight, NPCs with whom to converse and a robust crafting system to make weapons to your heart’s content. It sounded almost too good to be true, but I couldn’t help but get excited. It was a harrowing wait. First, it was a Summer 2013 release, then that faded off into Fall 2013. By December, I didn’t think we’d be seeing a 2013 release at all. Just as hope faded, though, news of an open beta on December 4 broke, and I jumped at the chance to finally try the game out for myself. What follows is a brief account of my first few days with the game, and my thoughts on whether it lives up to the hype. As with most sandbox games, I find them to be at their best when they’re played with friends. With this in mind, I enlisted my buddy, and fellow sandbox fan, Mike, to play through the game with me at this early stage. One of the things that drew me to Starbound was the assortment of races for players to choose. Currently, the playable races are your run-of-the-mill Humans, the amphibious Hylotyls, plant-like Florans, the simian Apex, the bird-like Avians and the robotic Glitch. Energy-based life forms known as the Novakid will also be playable, but they have yet to be implemented at this point. From what I can tell, there’s no difference between the races from a gameplay standpoint, it’s purely up to each player’s personal preference. After playing around with the character creator a bit, I decided on a female Floran who looked like the Pokémon Gloom, who I named Plume. It seemed appropriate. Mike, on the other hand, chose a male Avian who he named Songtail. 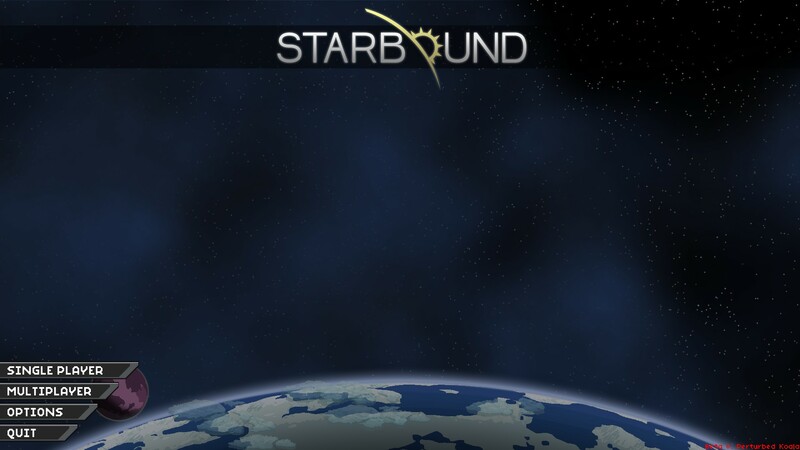 After getting a server set up, we jumped in to see what the world of Starbound had in store for us. The game starts each character out in their very own starship. You have run out of fuel, and need to search the planet below for some way to get moving again. Before venturing into the unknown, however, the game starts you off with a brief tutorial. It’s a simple enough interface that the game does a fair job of explaining. Players are first tasked with opening their “Shiplocker,” where they are to retrieve their Matter Manipulator, or “MatMan” as we called it. It’s a great multi-tool that comes in handy in a variety of situations. While games like Minecraft and Terraria had you interact with objects at point-blank range, the MatMan lets you dig, chop trees and place tiles from a distance. This makes building structures much easier, as you don’t have to constantly climb as you build up farther and farther out of reach. The catch here is that it gathering materials with the MatMan is a pretty slow process, and it can take many, many seconds to cut down a tree or harvest minerals from rock. So, while it’s a pretty helpful item, you’ll want to craft some more traditional tools like axes and picks as soon as you can. This is done pretty much the same way as it is in Terraria, where you can pick the tools you want from a list of products. All you have to do is gather the necessary materials and the items will appear in your inventory. There’s only so much you can make with your own two hands, though, so you’ll want to make a Crafting Table, Furnace and Anvil once you have materials. The creature on the left is docile, the one on the right is aggressive. I am baffled. As we explored the area around the spawn point and gathered materials for a shelter, there were a few different types of creatures that we came across. One of the ways that Starbound aims to keep things fresh as that all of the creatures that you encounter are procedurally-created from a pool of different body parts. This helps keep things interesting as you travel on the surface, as well as dig deeper down into the earth. One problem, though, comes up when you realize that a creature’s appearance has nothing to do with its aggression. Some creatures are docile, while others will attack on sight. The only way to tell the difference (that I could find) was to simply approach the beast, weapon drawn, and see if it attacks. It would be nice if there was some way to know ahead of time whether or not any given creature is aggressive, as the “reckless approach” method can be pretty dangerous, especially on high-risk planets where critters can deal some pretty big damage, if not killing you outright. Hunger is also an issue, and you’ll need to eat periodically to keep your health up. Food is usually acquired by killing the local fauna. Any time you kill a monster, it will either drop some money (called Pixels), skin or meat. Meat usually drops pretty rarely through normal means, but the likelihood increases greatly if you use a Hunting Bow. 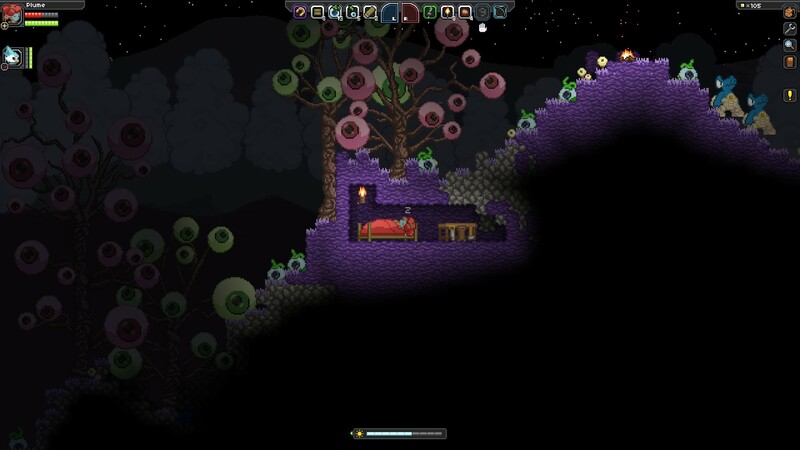 As a Floran, I played as more of a vegetarian, taking the eyeball fruits from the strange trees on the planet. The description said that Florans could eat them, but they could be poisonous to other races. Even so, Songtail ate a few, but he never experienced any negative effects. At some point, I decided it’d be a good idea to go off on my own and see what was hiding farther out in the wilderness. Unaware of the time, it started to get dark, and I was nowhere near the shelter. I did my best, but night fell before I could make it back. It was at this point that I found what happens when the sun goes down. Like most other games in the genre, things get more dangerous at night. I didn’t really notice any different kinds of monsters than I seen during the day, but the ones I did see were more numerous, and seemed to be stronger. As I knew I was nearing the base camp, I tried to power past a group of creatures in my way, but this only succeeded in getting me beaten within an inch of my life. With little recourse, I dug a hole and blocked it off, thinking it best to just wait it out till morning. I put up a bed and took a nap to build up my health. I noticed a meter appear at the bottom of the screen, as you can see in the image. The sun icon led me to believe that this was some kind of clock that would tell me when morning would come. As the meter went down, the screen began to fade out. I figured it was just getting foggy. I had already experienced rain while on the planet, I assumed fog would be another weather effect. Strangely, once the meter emptied, the sun still would not come up, and it was getting harder and harder to see. Eventually, I couldn’t see at all, and I started rapidly losing health. I had a mini-panic attack, as memories of Don’t Starve came rushing back. Before long, my health was depleted, and I died. A short animation played where a copy of my character was spawned from a seed, and I again found myself back on my ship, no worse for the wear. I eventually figured out that that sun meter was not a measure of time, but of my body temperature. The screen faded out as I got colder, and I hadn’t been attacked by some unseen beast – I had frozen to death. So, on top of the usual “death by violence” that we’re all used to, players also need to be aware of the temperature, on top of hunger. Pretty much any light source generates some amount of heat, though campfires seem to be best.